Illinois bedrock map Geological columns show the relationship of various rocks. Bedrock maps are what the rocks would look like at the surface, if all the loose surface material was removed. When you color in your bedrock map of Illinois, use a different color for each age of rock and color in the key and your geological column to match. Click on the cross-section to go to a larger version which shows the LaSalle Anticline in detail (Bretz, 1939). It is not possible to do all the things on this page in one day. Begin this trip in the town of Utica. Walk 2.5 miles west to Split Rock along the old towpath on the south side of the canal. Watch out for frogs and turtles if it's warm enough. 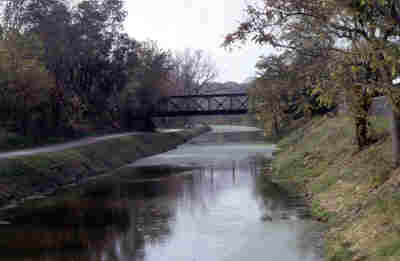 The 96-mile long, I and M canal linked Chicago and La Salle. It was started in 1823 and cost $6.5 million when it was finished in 1848. Fifteen locks and an aqueduct were built along the way. The Stevenson Expressway was built on top of the I and M canal from Damen Avenue to the town of Summit. Melissa Michelson is standing in front of Split Rock. Here the Platteville limestone lies on the St. Peter sandstone. 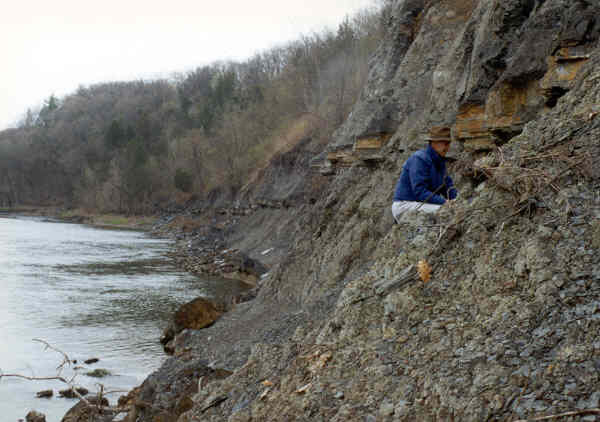 Both are dipping, truncated and capped with flat-lying Pennsylvanian-age limestones of the LaSalle Bond formation. We are close to the axis of the Anticline here; the rocks show us the deformation was after the sandstone, but before the limestone. Some old guide books suggest walking down the hillside north of the railroad tracks, but now it is all private property and access is not available from that side. It was once one large outcrop, but was blasted apart for the canal in 1846. The "Split Rock" was also once an anchor for an excursion railroad which brought Chicagoans out to the Starved Rock area. Chessie Railway System tracks go through the northern half of Split Rock. Watch out for trains. you may choose to visit the LaSalle County Historical Society Museum in Utica, the Illinois Waterway Visitor Center or continue east along Route 6 to Buffalo Rock State Park, and the towns of Naplate and Ottawa. is a great place for winter raptor watching as the pools above the dams stay clear of ice due to the flow of the water. There is a 17 to 19 foot drop in the Illinois River at this point. The earliest known European explorers of the Joliet and La Salle parties overwintered near here since they could protect the river approach at a rapids with their cannon. It is possible the site was destroyed during WWII-era strip coal mining along the river and some have suggested they camped at what is now known as Buffalo Rock State Park. The visitor center run by the U.S. Army Corps of Engineers (815-667-4054) makes a very pleasant group stop because it has bathrooms, pop machines and picnic tables adjacent to the dam. Inside are exhibits about the Illinois River and information for boaters and recreational users of the waterway. If you are lucky, you may watch a barge going through the locks between the dam and the visitors center. There is a beautiful view of Starved Rock itself from the observation deck and the lawns. If you have binoculars or a telescope you can see solution cavities and caves in the Starved Rock member of the St. Peter Sandstone across the river. The middle Ordovician St. Peter is an incredibly pure sandstone which is found from northern Michigan to Kentucky and from Kansas to Ohio. It is exposed in Dixon, along the Sandwich fault and in the Ottawa to LaSalle area along the anticline. 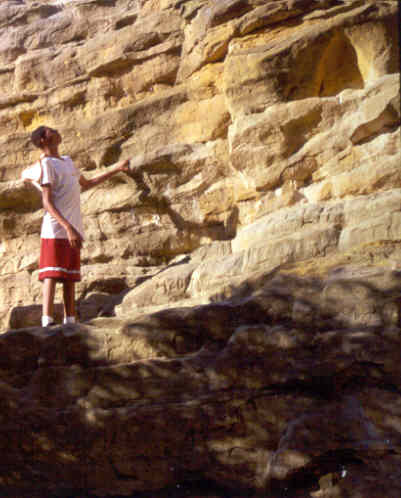 has a lovely exposure of the St. Peter sandstone in a played-out rock quarry. As usual, groups over 25 need to contact the park ahead of time (815-433-2224). Turn right (south) into the park and drive uphill along the entrance road. We found out that school buses do fit but it's a fun ride! Continue to the westernmost end of the parking lots. Park near the picnic tables and the primitive facilities and walk the trail west to the top of the quarry highwall. Be very careful. It is at least a 30-foot drop to the bottom. 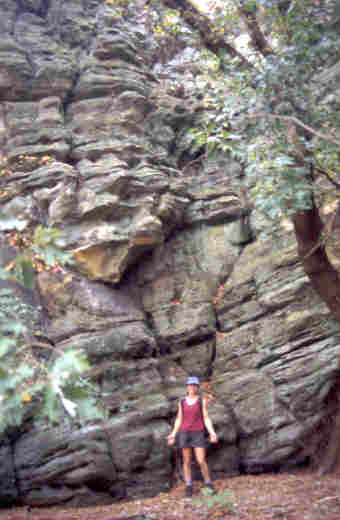 You can see the contact between Pennsylvanian-age coal and Ordovician age St. Peter sandstone at the top and follow the trail along the right edge of the quarry to the bottom. The discoloration on the high wall shows where the water flows when it is raining. Lisa and Nancy are drawing a measured section for Historical Geology. 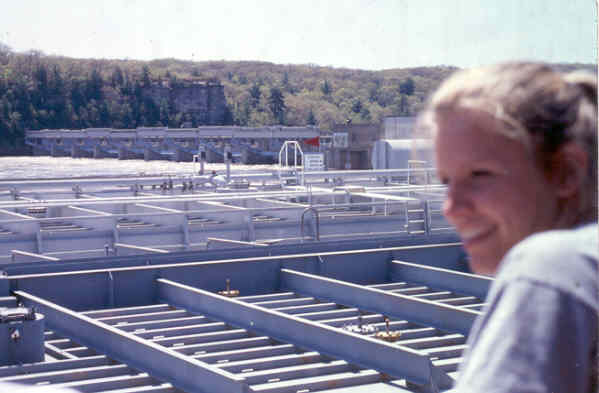 Lisa is at the top of the highwall and has dropped a large-print tape measure over the edge. Nancy is using the tape to mark the exact height of certain features on the wall. 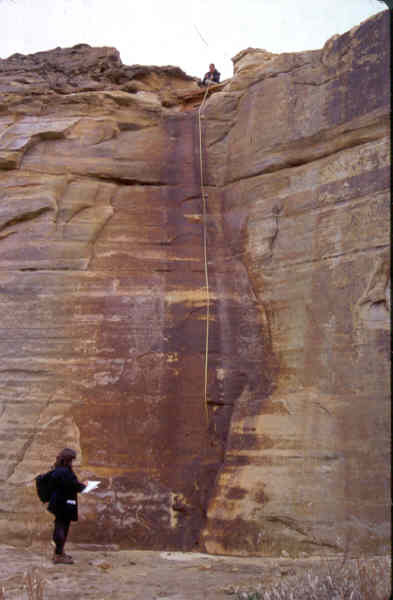 You can also see crossbedding, pyrite formation and framboidal iron pyrites in the sandstone. This is a great place to learn about bedding, weathering, and jointing, to look at the sandstone through a handlens and to observe the various types of pyrite (some looking more like marcasite) within the pure, sandblasted grains of this ancient deposit. Bring a jar with a screw-top lid to collect a little sand and water from the bottom of the highwall near the waterfall and grow your own "Illinois Sea Monkeys." Leaving Buffalo Rock, turn east (right) along Route 6 and drive along until you come to the town of Naplate. Notice the deep quarry pits where sandstone has been removed for the glassmaking industry and the huge cemeteries. If time permits, read some headstones. Many died building the canal, quarrying limestone and sandstone, or of water-borne diseases; beginning in the mid-1800s. Continue along old Route 6 and look at the the lovely homes and the Greek peristyle. Continue along Route 6 into the town of Ottawa for services and food. Get back on Interstate 80 here by following route 27 north to the junction or follow the Illinois River Valley northeast by taking Route 6 east. Stops south from Utica along Illinois 178. As you cross the Illinois River, look at the river as you go over the wide Illinois River flood plain. If you have a high vehicle, you can see the locks and dams to the east (left). 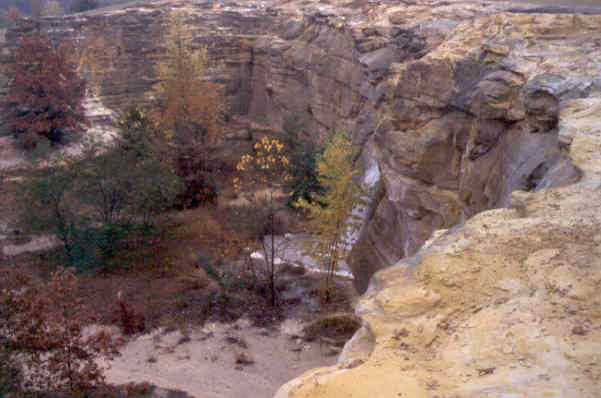 The roadcut bisects the Starved Rock sandstone formation. Mattheissen State Park "Dells" Entrance. Park near public restrooms and picnic tables. There are pop and water machines and a log-built "replica" of La Salle's fort alongside a giant picnic shelter. Groups over 25 need to contact the park (815-667-4868). Walk down the stairs. You pass through glacial till and arrive at a bridge over the canyon. You can find the contact between the wavy-bedded late Ordovician Platteville Group and the thick and regular mid Ordovician St. Peter Sandstone at the west end of the bridge. 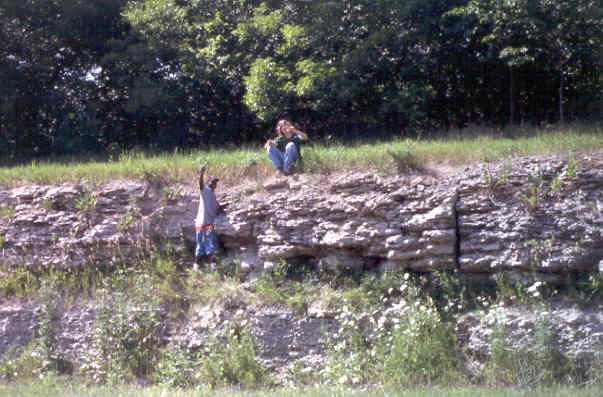 The Glenwood formation (found elsewhere in Northern Illinois) is missing, so this contact is an unconformity. Looking south at a lovely cavern cut in the side of the old Deer Park dells in the St. Peter sandstone you can that it was relatively high water in the Spring of 1999. The unconformity between the Paleozoic and the Pleistocene shows as the tree line above the rocks in this picture. This is a relatively young canyon as hanging valleys enter it and have not yet had time to cut down to the base level. At low water (usually in the Fall) you can walk the lower canyon and see the waterfall from the upper canyon which is directly below the bridge. For safety's sake there is a gate at the waterfall. 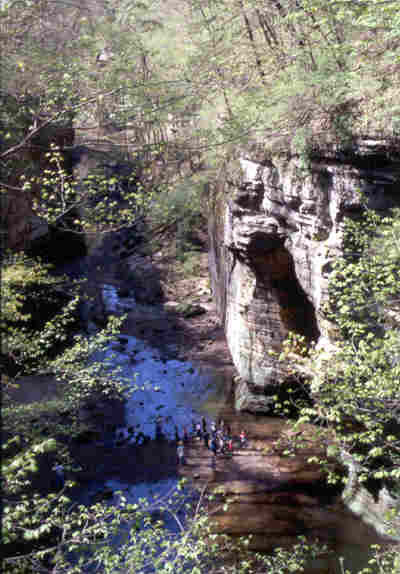 There is no connection between the upper and lower canyons along the stream. If you turn left from the bridge you can take a staircase down to this spot in the lower canyon. Or you can stay on the main trail and follow a small trail over the ridge to the Vermillion River. Absolutely do not attempt to follow the stream through the canyon to where the stream and the Vermillion meet. It is deep mud regardless of the season. 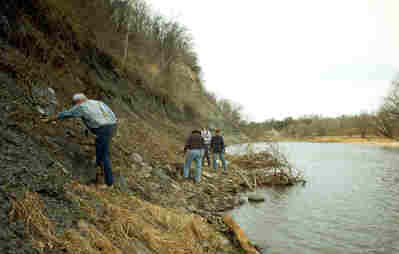 At the river's edge, the Platteville dolomite beds are obvious - and sharply dipping (27 to 34 degrees) to the west. The rocks are full of worm burrows and other fossils. Watch your step or prepare to get wet! Cricket frogs are often found hopping along the rocks. Walk back along the high trail to the main bridge. If you turn right at the main bridge, walk only a short distance to the staircase into the upper canyon. As you first enter the canyon you can see cross-bedding in the St. Peter. Unfortunately, you can also see where some one who thought they were being "cool" has hammered a deep gouge in this protected rock. Cross the stream on the stepping stones and climb the stairs to go further up. Garter snakes and water snakes are often found under the waterfalls coming from hanging valleys and tumbling over weathered ledges. Perhaps they're waiting for dinner to "drop in." If the water is low, you can follow the canyon all the way to its shortest end; high water requires you exit on the next set of stairs - or maybe even back track to the first set. Turning always left from the top of either staircase will return you to the main bridge. Canoe Launch Ramp before the Lowell Bridge. Turn right (southwest) down a small road to get to the ramp. Do not attempt this road with anything bigger than a 15-man van. After parking out of the way of the houses and driveways, walk to the river and take the side trail to the left, down a rough gravel and timber stairs to the Vermillion River. Canoists use this ramp because Wildcat Rapids occurs just upstream. Immediately adjoining the stairs is a small stream channel cut into the Platteville. 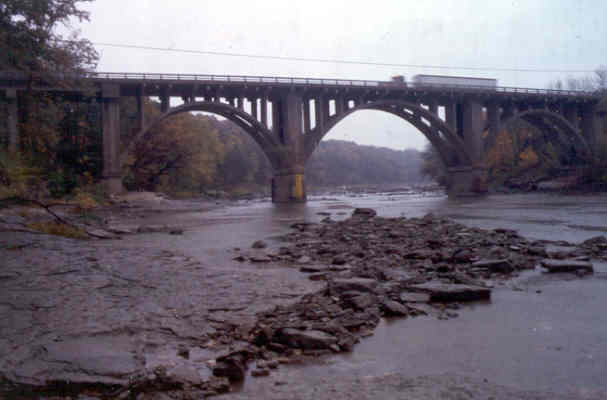 It flowed and deposited sediment during the Pennsylvanian. Look at the Lowell Bridge. You will see the yellow bridge gage painted on the north leg. If the water is low, you will be able to walk far out into the river on the block jointed Platteville limestone. The best fossil hunting on this pavement is in early spring when the freeze/thaw cycles of winter have heaved open new bedding planes and exposed more fossils. There is a fault at the canoe launch which is filled with Pennsylvanian deposits. It represents a significant unconformity. in the Margery C. Carlson Nature Preserve, owned by Illinois Department of Natural Resources. Groups over 25 need their permission to park and take the trail. You cannot park anything bigger than a 15-man van adjoining their gates. If the water is very low, you can park on immediately on the other side of the Lowell bridge and walk the edge of the river to get to the cyclothem; else it is a long hike through the nature preserve and a fun 150 foot gully scramble to get down to it. If the river is high enough to cover any part of the yellow gage - do not attempt either the river walk or the gully scramble as the basal member above water is a shale - weathering to slippery clay. The cyclothem reveals parts of the rhythmic deposits which record fluctuating sea levels due to southern hemisphere glaciation during the Pennsylvanian. Geomaterials include sandstone, limestone, the Francis Creek Shale with slightly metamorphosed concretions and coal. 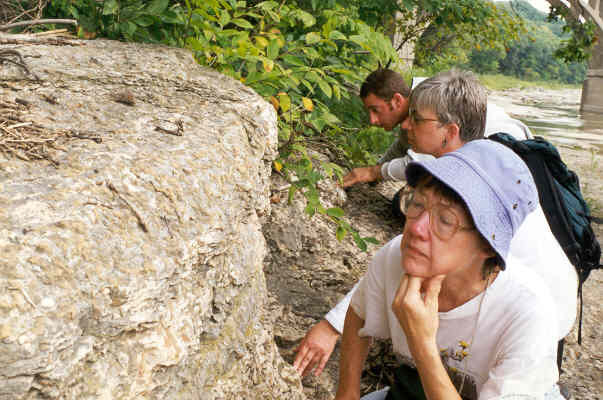 We learned the hard way not to come down here when the water was high as shown in this photo of Richard, Eugene and other Morton Arboretum geology students in September 1996 (left above). No full cyclothem is preserved here, but parts of several unconformably overlie each other. Another year, John climbed up the layers of shale and limestone nodules to look at this thinly bedded limestone unit (right above). We have found no fossils on this hillside, but pyrite and selenite crystals due to weathering of the coal and underclays. The metamorphosed concretions from the near basal Francis Creek Shale are fascinating. 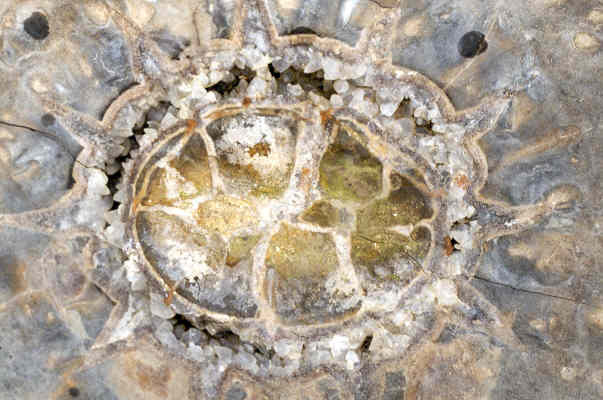 The one in this picture was the center of a 20-inch diameter concretion which had cracked and calcite minerals formed in the voids. Further east at Braidwood, this same shale is the parent material for the famous Mazon Creek concretions which preserve soft-bodied fossils. The road cut on both sides of Route 71. Watch out for traffic and be sure your vehicles are pulled off the road at the parking areas at the bottom of the road cut by the Vermillion River. Groups over 25 need permission to enter the nature preserve. Do not enter the nature preserve other than to observe. The rock is Pennsylvanian-age Bond Formation limestone. This is a great place to take out your dissecting probe or bamboo skewer and find abundant silicified brachiopods (usually less than 1/2 inch long) and tiny crinoid stems. Trilobites have been found high in the road cut on the north side, and silicified fish teeth have been separated from the carbonaceous matrix. Take some flat containers and a gallon of household vinegar. Put some of the fossils into the vinegar and clean off all the matrix. Neutralize the vinegar with plain water and then observe the perfectly preserved fossils with your hand lens. Since most of the fossils found here are very small, but we know these same species grew larger; and because of the odd bioturbation of the sediments adjacent to the small fossils, it may be that bigger animals were able to free themselves from the smothering layers of silt or ash that buried the smallest ones. stop along Route 71 at Covell Creek, about 6 miles east of the intersection of Route 71 and 178. It takes some finding, but there's rock exposed along the edges of the creek by the bridge and up the stream; there's also a loop drive to the edge of the Illinois river east of Covell Creek by about 1/10 of a mile. Canoe guides rate Covell Creek as a lot of fun if there's any water in it. 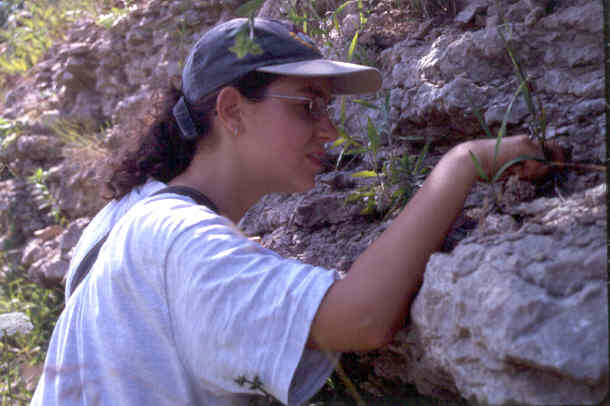 Fossil hunters prefer low water for actually seeing the rocks. In extremely dry seasons, you can walk a considerable distance upstream on the rocks. continue to the town of South Ottawa, turn north and cross the Illinois River. There are services in Ottawa and food. From here you can either hop back on Interstate 80 or proceed up the Illinois River valley along Route 6. Reference material to prepare for field trip. For all citations, use my list of Illinois Geology - Useful Publications from various sources covers more of the state; some are technical publications. Print out a topographic map of La Salle quadrangle from Topozone. Set the map scale at 1:24,000, print at 1:200,000 scale, centered on 41.3094N, -89.0100W. Ordovician fossils and Pennsylvanian fossils from Willman, et al. 1975. 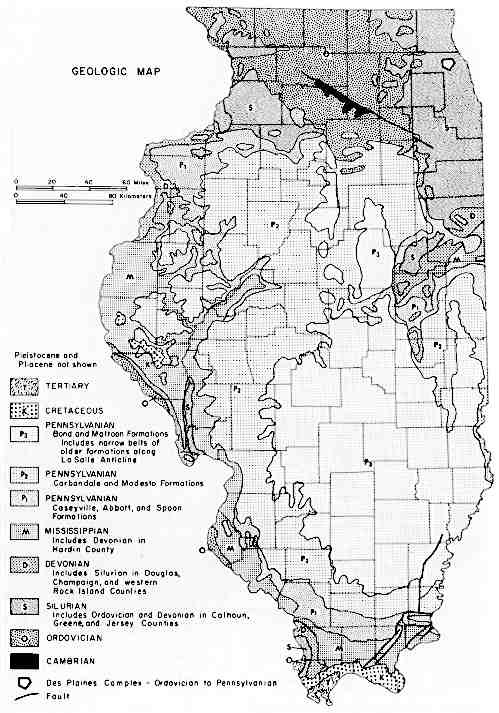 Resources from the Illinois State Geological Survey. Read the ISGS Guidebook to Buffalo Rock. The printed guidebook is available from ISGS field trip guide book home page. Check out the high and low points by clicking on LaSalle County from this page of all the counties in Illinois. Read Pleistocene Glaciations in Illinois to understand the glacial erosion and deposition which coats Illinois bedrock. Trace the faults and folds of Illinois on this structural map of the state. Illinois Department of Natural Resources. Building the I and M Canal. Links to other places along the way. Watch out for the Split Rock picture which says that the Shakopee Dolomite is on top of St. Peter Sandstone. It's not. Visit Starved Rock Lock and Dam on this virtual field trip from a professor at NIU. 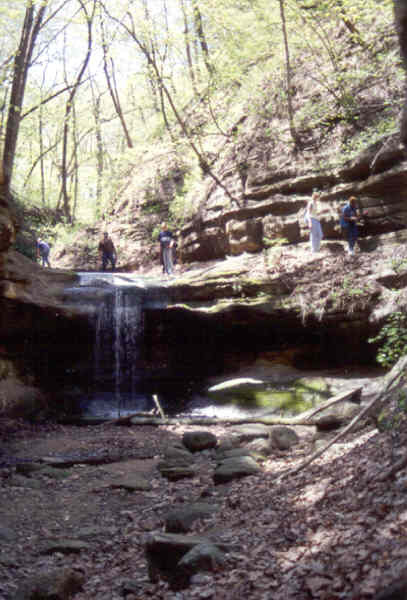 Starved Rock State Park home page.